The Blaine County School District board of trustees voted 5-0 late Friday afternoon to accept a separation agreement between the district and Superintendent Lonnie Barber. Barber’s sudden departure from the district became effective Monday. Assistant Superintendent John Blackman has been appointed interim superintendent. Trustees Kathy Baker and Kathryn Graves met Monday morning with the Idaho Mountain Express to discuss the situation in a meeting arranged by school board Chairman Paul Bates. Baker and Graves said Bates was unable to attend the meeting because of a family emergency. Baker and Graves described Barber’s termination as superintendent as an “amicable mutual separation.” They said the decision was not instigated by one side or the other. Baker and Graves declined to discuss specifics of a difference in philosophy between the board and Barber. They also declined to discuss terms of the separation agreement, or to release a copy of the document to the Express, saying that they didn’t want it to interfere with ongoing settlement negotiations with contractor McKinstry Essention in multi-million dollar litigation between the parties. Baker and Graves also declined to discuss how the separation agreement might interfere with negotiations with McKinstry. The litigation with McKinstry stems from a 2010 contract the district entered into with the company for energy savings work and other improvements at eight district schools and facilities. In a lawsuit filed in May of 2012, McKinstry claims that it performed work worth about $26 million and is seeking an alleged unpaid balance of between $6 million and $7 million. In a counterclaim, the district claims that it only authorized work worth $18.6 million and is seeking damages against McKinstry for at least that amount. The case is scheduled to go to jury trial on April 8, 2014, in Blaine County 5th District Court. Barber has served as district superintendent since the summer of 2009, when he was approved for the position following the retirement of then-Superintendent Jim Lewis. Before that, Barber served as assistant superintendent for two years. 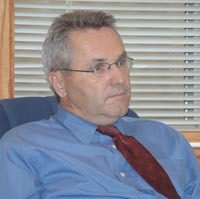 Prior to coming to the Blaine County School District, Barber was superintendent of the Caldwell School District. Barber’s annual salary with the Blaine County School District was about $160,000. He still had almost three years remaining on his contract, having been approved for a contract extension by the school board in March. The vote then was 5-0 in favor of an extension. Board members then were Chairman Steve Guthrie and Trustees Shawn Bennion, Don Nurge, Bates and Graves. Guthrie and Nurge are no longer on the school board. Guthrie was defeated in an election in May by Baker and Nurge resigned in June to be replaced by new Trustee Elizabeth Schwerdtle. Baker made no public comment prior to winning her school board seat when Barber’s contract extension was discussed by the board at the March school board meeting. However, her candidacy for school board was strongly advocated by district patrons opposed to Barber’s contract extension. “I think that’s something worth listening to,” Schwerdtle said then. The School District issued a news release Monday morning regarding the board’s decision on the settlement, which came at the close of a 4 p.m. Friday executive session. However, the news release provided no additional information regarding the board’s decision. Barber declined to comment further in a brief telephone interview Monday with the Express. Baker and Graves said the district will conduct a nationwide search for a new superintendent. “Our goal is to have a new superintendent by the beginning of the next school year,” Baker said.